Rare maps showing the legendary Mines of St. Barbe. 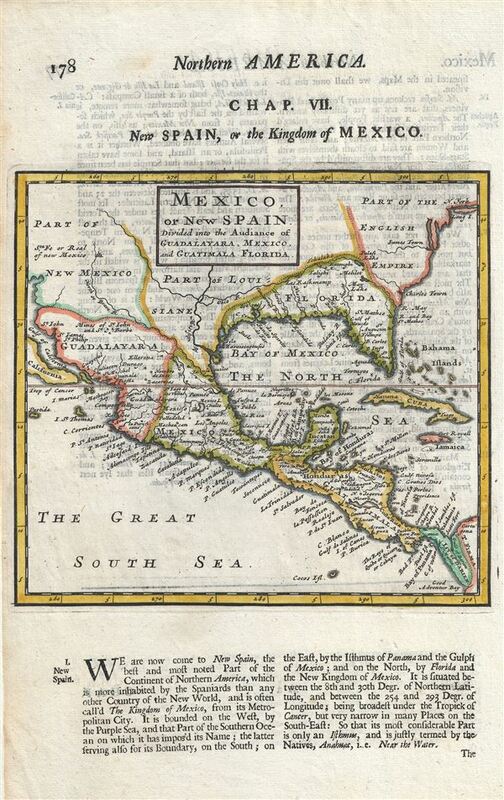 Mexico, or New Spain Divided into the Auddiance of Guadalayara, Mexico, and Guatimala, Florida. An uncommon 1701 map by Herman Moll of Mexico, the Gulf Coast, and Florida. Centered on the Gulf Of Mexico (the Bay of Mexico here), this map covers from Baja California to Florida and Cuba, covering in the process, the Gulf of Mexico, parts of New Mexico as far north as New York and Santa Fe, and as far as south as Panama. Based on Moll's maps from the same issue of A System of Geography, the southern part of what appears to be Baja California here is presumably a part of Insular California. The Spainich possession of Florida extends west as far as Louisiana, while Texas is 'Part of Louisiana.' The Ohio River flows west past the Mississippi, into texas. Perhaps this maps most striking features are the 'Mines of St. John and St. Barbe.' Although called by some the El Dorado of New Spain, these mines are in fact real and were well known in the 17th century. The Mines of St. Barbe are better known as the Santa Barbara silver mines of Chihuahua-Durango. These mines were first discovered in 1567 by the Spanish Conquistador Rodrigo del Rio de Losa. Although initially difficult to exploit due to extreme remoteness and lack of indigenous labor in the region, by 1600 Santa Barbara had grown to a population of 7000 and was well on its way to becoming a wealthy silver town. Rene Robert Cavalier, Sieur de La Salle, a French nobleman, explored the lower reaches of the Mississippi from the north, reaching the delta in 1682. Recognizing the enormous profit potential in controlling the Mississippi River, thus linking French colonies in Canada with the Gulf of Mexico, La Salle returned to Europe to petition the King to build a settlement at the mouth of the river. Permission granted, he returned to the Gulf Coast to found Fort St. Louis. Unfortunately, La Salle was unable to rediscover the mouth of the Mississippi due to difficulties in measuring longitude as well as the inherently confusing nature of that coastline and instead founded his colony far west of its intended location. Although it may have been an error that La Salle founded his colony far to the west of the Mississippi at Matagorda Bay, he was certainly aware of the political implication of its perceived proximity to the Santa Barbara Mines. In addition to several eastward expeditions in search of the mouth of the Mississippi, there is strong evidence that La Salle also traveled extensively west of the Mississippi, no doubt in hopes of seizing the Santa Barbara mines. Louis Hennepin, a Franciscan Recollect priest, both a high ranking member of La Salle's expedition and a potent rival to La Salle, claimed that La Salle intended to seize glory in the form of the Santa Barbara mines before he set out on his first expedition. Such was not an impractical ambition. When La Salle sailed from France to found his colony France and Spain were at war. Seizing Santa Barbara would have been a major blow to the Spanish and both a territorial and financial coup for the French. Little did he know that the war with Spain ended just two weeks after he sailed from France and the two nations had become cautious allies. Curiously, despite Santa Barbara being a prominent and wealthy silver city, and one of the northernmost outposts of New Mexico, back in France La Salle's failure to discover it gave the city an El Dorado mystique. John Law, the Scottish economist, millionaire, con-artist, and murder, wasted no time in capitalizing the Santa Barbara legend to promote his nascent Mississippi Company. He disseminated rumors that the 'mines of St. Barbe' had been discovered and passed out gold ingots supposedly from this mine. Speculation on the mines, as well as other scams, pushed the stock price to astronomical highs, creating one of the world's first bubble economies. This was possible because of cartographers like Moll who made the legend of the Mines de St. Barbe part of early 18th century French popular mythology. This map was issued as part of the 1701 issue of Herman Moll's System of Geography.